SO0033 2966. The “almost” perfectly square-shaped earthworks of the Roman fort of Y Gaer (Brecon Gaer) or Bannium Cicucium are located on a low ridge in a farmer’s field about a quarter of a mile north of the A40, just to the west of Llanspyddid. The town of Brecon lies 1 mile to the east. Y Gaer farm is partly built over the northern defenses and the site is on private land. It was built between 75-80 AD in the area held by the Silures tribe and manned by a garrison of 500 cavalrymen (Ala) from Vettones in Spain, along with some captured prisoners who were put to work on building the fort. The confluences of the rivers Usk and Ysgir straddle the valley close to the fort, something which the Romans were obviously aware of and would have considered to be an excellent place to build a fort. The fort held a strategic position close to a major Roman road linking other camps and forts at Gobannium and Isca to the east, while to the west two temporary marching camps at Y Pigwn and other nearby forts at Alabum, Coelbren and Moridunum. But the first fort here was made of timber with earthen ramparts and two ditches, then in c140 AD this was replaced by a stronger, stone fortification that was built by the 2nd Spanish Augusta legion. However, the occupation here may have come to an end in 200 AD although, evidently, there were two more occupations during the 3rd and 4th centuries AD. The walls stood to a height of 10 feet and there were guard towers at each rounded corner of the fort and three gatehouses – although four entrances were built in the centre of the N, W, S and E walls, that at the N side now built over by a farm building; altogether the fort measured 615 feet by 460 feet. The headquarters buildings, barrack block and granary were, as always, inside the walled defenses as was the bath-house which was attached to the barracks for ease of use – normally this would have been outside the walls, and outside the N gate was the cival settlement (vicus) for the labourers, many of whom were captured prisoners. In 1924-5 the site of Y Gaer was excavated by Sir Mortimer Wheeler and most of the buildings uncovered for the period of the dig. A number of antiquities were discovered but, the most impressive artefact was the tombstone of a young cavalryman called Candidus, which is now housed in the Brecon museum. Today some of the walls are still visible, but with more recent stonework being built onto them, and the S and W gates remain as they were found. The earthen defenses are visible along the sides of the fort at the W. S and E sides, that at the N side less so due to the “unfortunate” building of Y Gaer farm. 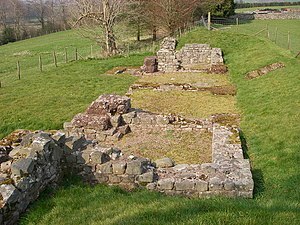 Categories: Roman Sites, Y Gaer Roman Fort | Tags: Roman Sites, Y Gaer Roman Fort near Brecon in Powys | Permalink.